It started of as a small bedroom with just enough room for two single beds. The floor was in poor condition and sloped quite a lot, from left to right in the picture; and yes the walls are not vertical! Fortunately the joists were made of oak, were still sound and had not been to seriously affected by the dreaded woodworm. The window was strange as part of it was hidden behind the partition wall (see below). 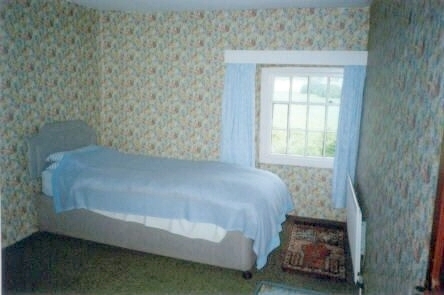 Refurbishing this room, along with the adjoining bunk room and landing, was one of our earlier major undertakings. It is now our bedroom and we can lie in bed and look out over Anne's field to the little bridge over the Gilpin and Scouts Scar beyond. ...to one side. The joists were raised until we got a fairly level floor. This was a major panic. Why are those studding uprights bowed? The large oak beam that formed part of the "A" frame holding up the roof had gone rotten where it went into the wall and was reduced from about 1ft x 1ft3" to about 5" diameter. And the studding was holding the roof up! Panic - quick dash to Kendal to buy an Acrow prop! I jacked up the beam (and the roof! ); the post was only just strong enough and there were lots of creaks and bangs from the loft space. I put in a large iron plate and cemented up - and Bob's your Uncle!. Those uprights are a bit bowed! ... and a sigh of relief...! Floor down and sound insulation in (the bunk room, where the grandchildren sleep, adjoins our bedroom - hence the extra sound insulation!). ..not bad for a beginner!